Of course, I think she has great taste since she reads Botanic Bleu and leaves witty, encouraging comments. Her sense of humor makes me laugh out loud. 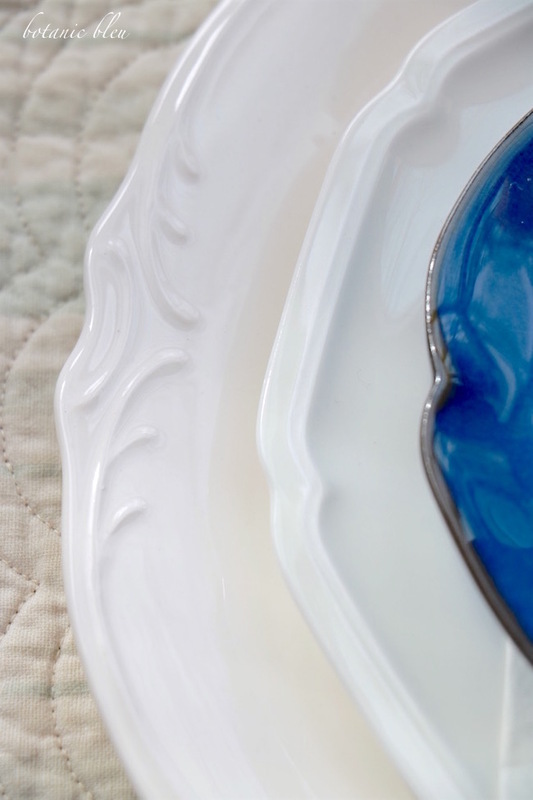 As soon as the four blue plates were in my hands, I was in love with their color, their shape, and their texture. As I ran my hand over the smooth plate surface and ran my fingers around the curved scalloped edge, I cocked my head a little to the left, and my eyes glazed over as I stared into space envisioning a future tablesetting featuring these plates. The blue plates are S T A R S in the dish world. This week I found a small bag of blue shredded paper used for Easter baskets in years past as I was reorganizing things in the garden shed. You know the shed that took all my money to buy it a French style eyebrow window. If you haven't read French Design on Friday 6, be sure to check it out to see the eyebrow window. Look at the color of the blue paper shreds... a match made in heaven for the new blue plate S T A R S.
Old Man Winter is not over yet, but our weather forecast high temperatures for the next ten days is 68°-78°, definitely Spring weather. My mind turns to eggs, bunnies, bird's nests... in Spring. 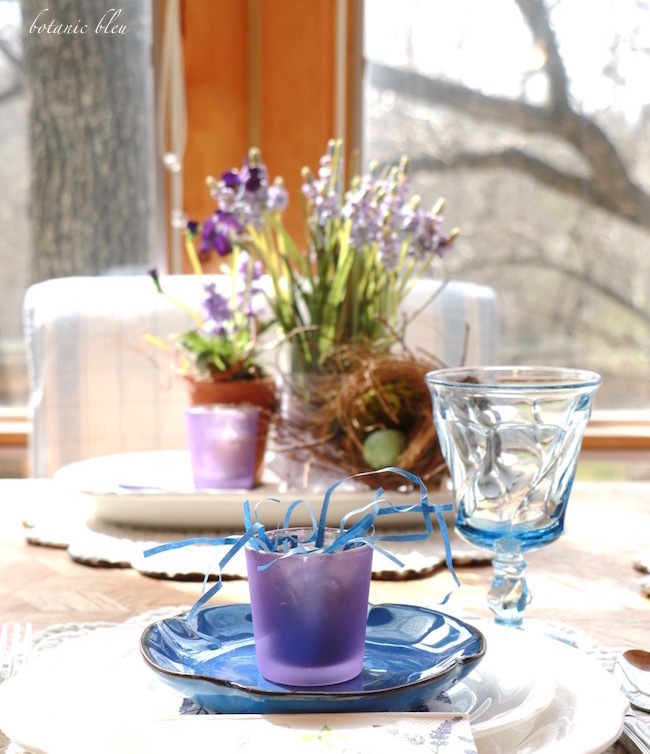 Once I made little blue paper shred nests in the purple votive candle holders, the whole early Spring blue and purple table starting coming together. 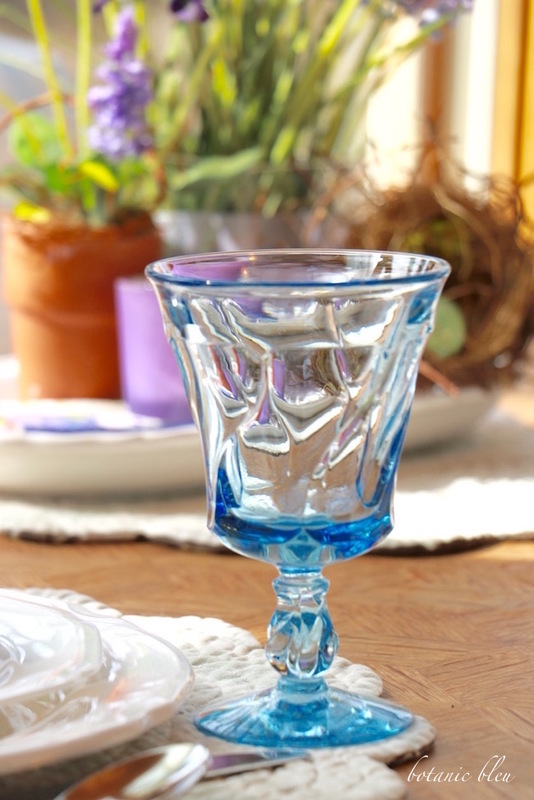 White scalloped edge dinner plates and salad plates perfectly showcase the blue S T A R S.
Blue Fostoria water glasses complement the little blue plates. 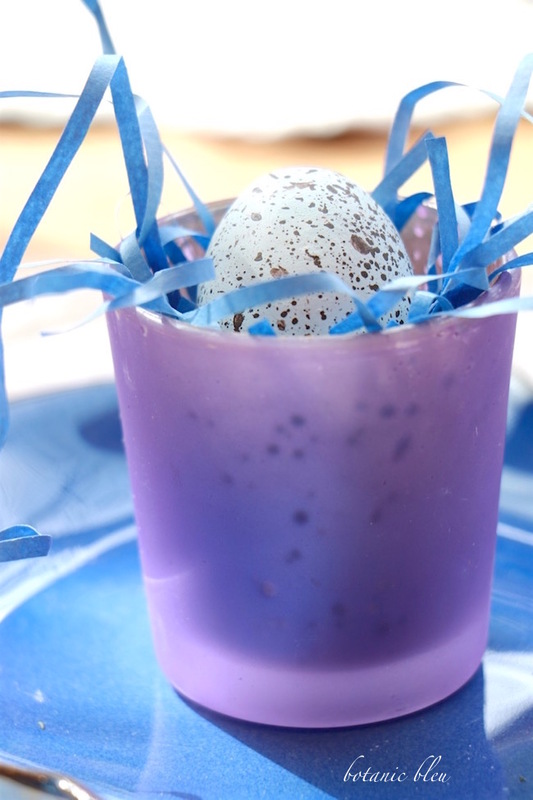 Paper napkins with lavender stems repeat the bird's nest element with eggs the same color and design as the little ceramic eggs in the purple votives. Sometimes everything comes together as though items were special ordered to coordinate with one another. 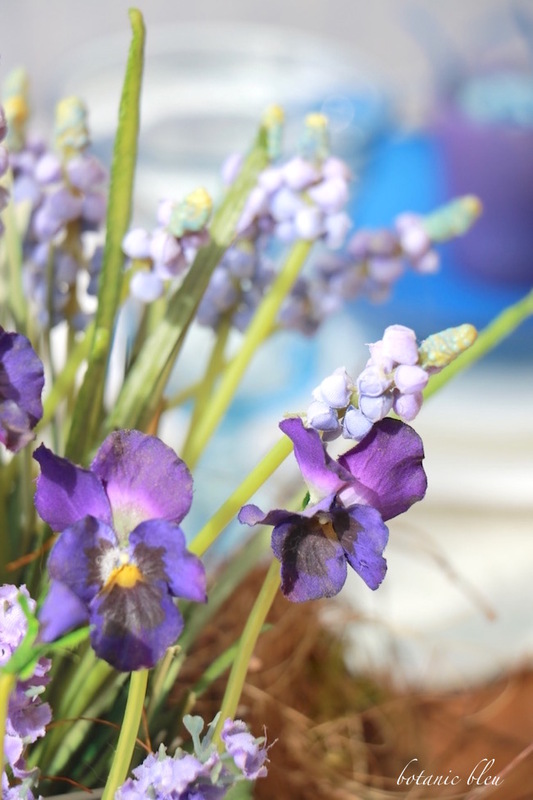 Spring-like weather means spring flowers like the purple pansy in the clay pot and the purple muscari. 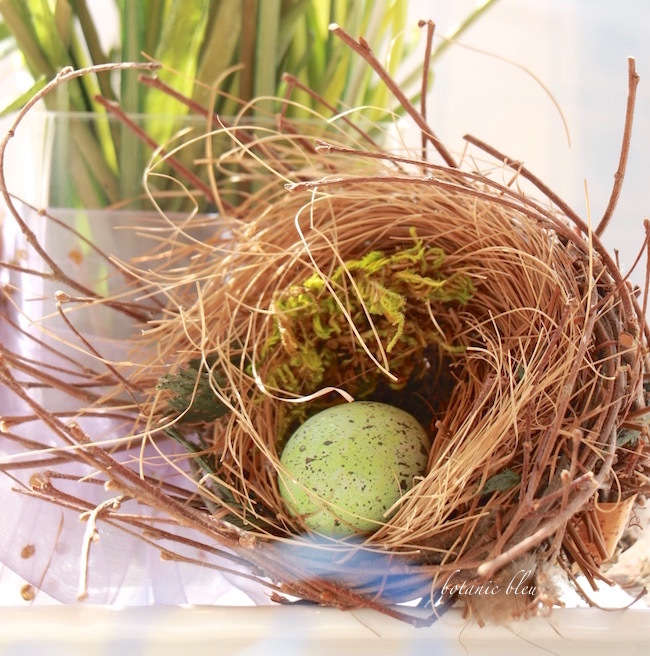 A twiggy bird's nest holds a green ceramic egg. Add a few extra things to a man-made nest to give it a natural look. Fine golden brown grass lines the nest to shelter the egg. A bit of green moss is another natural filler. Wild tendrils around the pansy plant make the faux flowers more realistic. 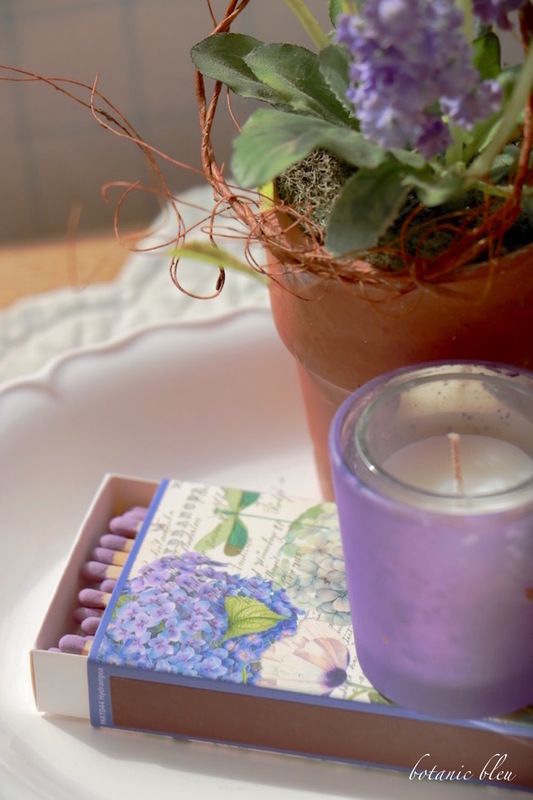 Purple-tipped matches in a hydrangea decorated match box go with the purple votive perfectly. 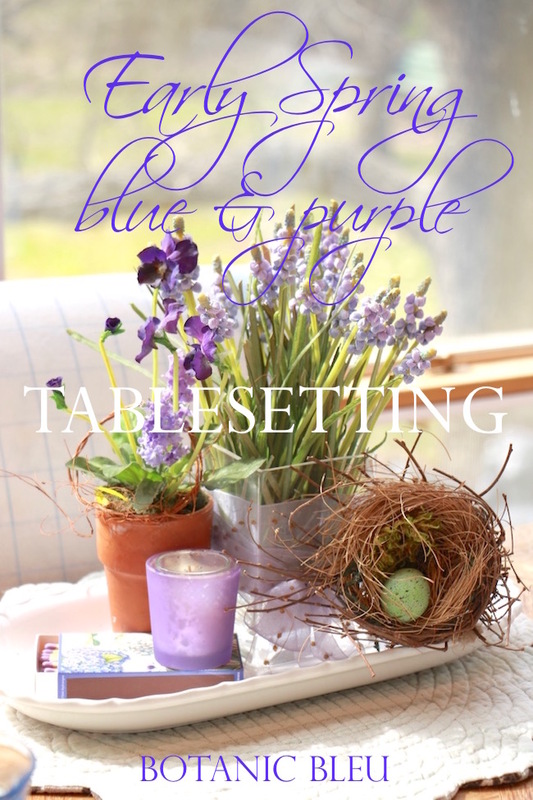 An early Spring blue and purple tablesetting adds color to the drab overcast winter skies. 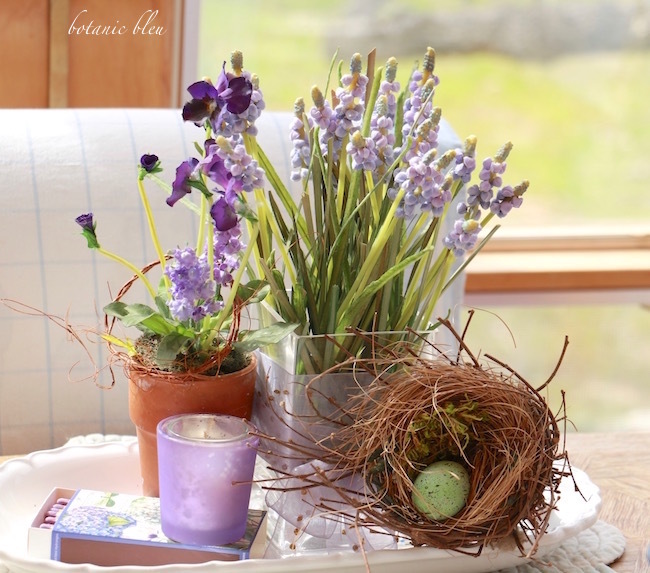 The centerpiece and votive nests can last until Easter in mid-April. Any day now, I will be able to cut fresh muscari from the yard. Won't they be pretty with the new blue plate stars from my friend? Receiving such a thoughtful gift from a long-distance friend made me reflect on all the wonder-woman friends who have touched my life over the years. Each of us has a circle of friends who have made a difference in our lives by mentoring us in our jobs, caring for us in times of despair, and adding joy in everyday living. Yes, I have men who are acquaintances and who have mentored me in a job, but they are never friends to the depth of women friends. The Long Tall Texan is the only man who has the status of wonder-man friend. Each time I moved from a job or moved from a city, I was sad to leave wonder-woman friends I had made. Yet, I soon realized that in each new job or new city were new wonder-woman friends for me that I would have never known if I had not moved there. Blogging has provided new wonder-woman friends I would never have known had I not started writing Botanic Bleu. My life is richer, fuller, more joyful because of all of the new wonder-women I know in the blogging world. Thank you for reading, for leaving comments, and for joining my circle of wonder-woman friends. 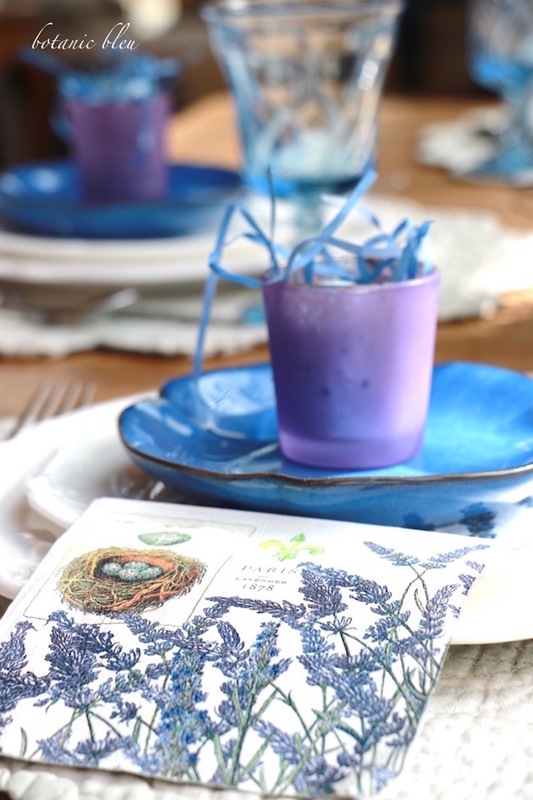 My friend in San Antonio inspired me to create a beautiful blue and purple tablesetting with her blue plates as the stars. This is just the first of many ways I will enjoy those little blue plates, and each time I use them I will remember our friendship. Now, I will think of those wonder-women friends as B L U E P L A T E S T A R S in my life. Thank you, my friend in San Antonio who knows me well. Who is a BLUE PLATE STAR in your world? 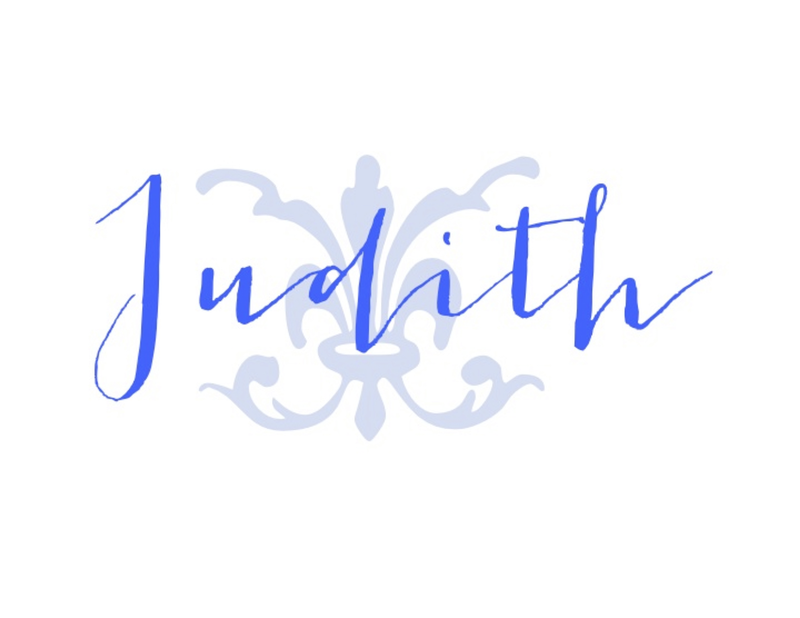 Beautiful, Judith! 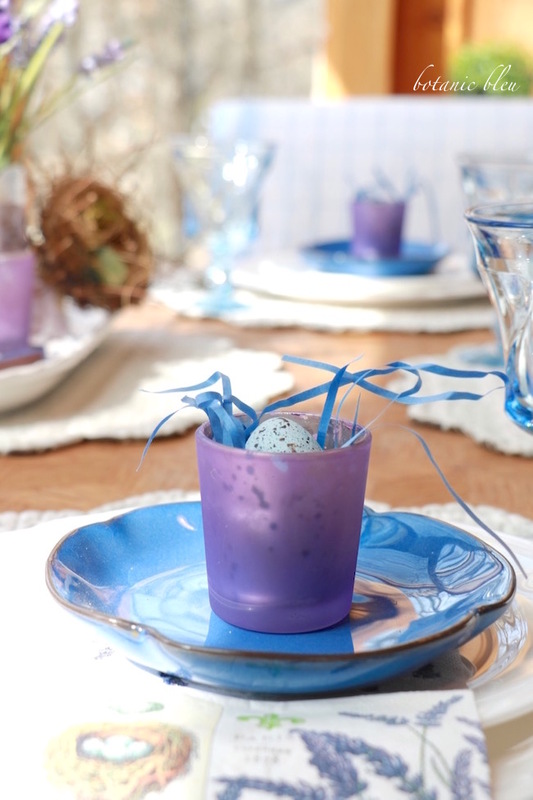 I love the blue plates and glassware with your white dishes. This is such a lovely table setting, the colors are heavenly for this time of year. Thanks for sharing the S T A R plates with us! It doesn't feel like spring here! We haven't had such a winter in decades! We're all lucky to have wonder women friends in our life! 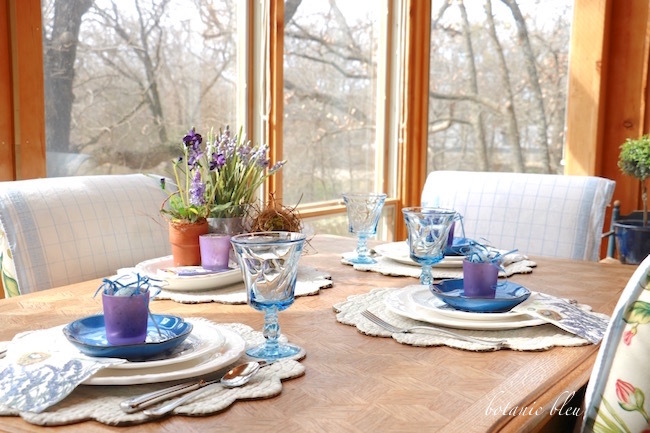 Happy to see the perfect styling of the "so you bleu" plates! Beautiful! I think purple and blue together is as pretty and subtle as green and blue. What a beautiful combination of color! Yes, those plates are perfect! What a gift, and what a nice way to say thank you, Judith! 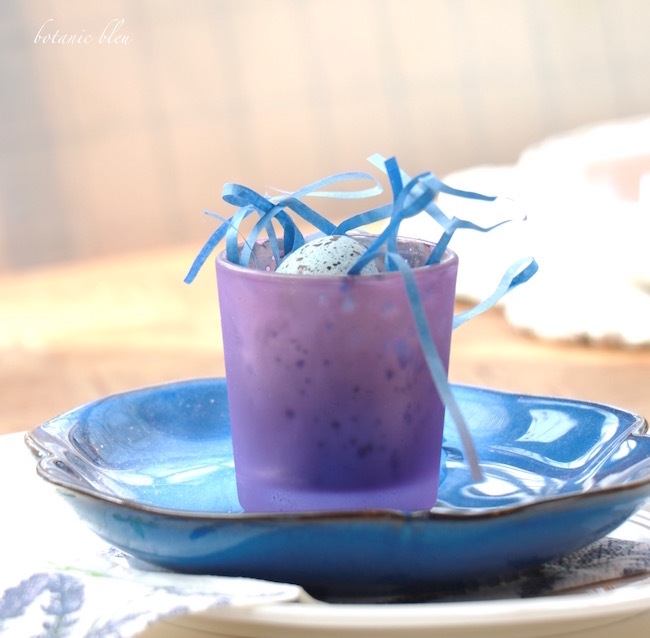 The blues & purples make for a great Spring seque. And those purple tipped matches! Like you, I am so appreciative for the friends I have made in blogging. When things happen in our lives, or we get creative sparks, isn't it so nice to be able to want to share by showcasing with words and photos? It not only captures the moment, but also our thoughts in those moments. The comments from readers are like having coffee (or tea) together, as friends. Have a great day, thanks for sharing. Hi Judith, your spring table looks incredible! You put me in the spring mood!!! Such a stunning table setting in honor of some very special ladies. 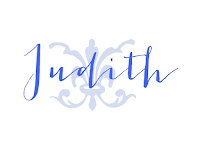 Enjoy your week, Judith. They are just beautiful and what a beautiful post. Our weather is gorgeous! I am so thankful for our blogging friends. Thanks for sharing. Delightful post, Judith. I love blue and purple together. The plates were a delightful gift from a friend and your tablescape is pretty, creative and quite charming. I have spring fever and am ready for birds nests. I have never grown mascari and think it is quite lovely. 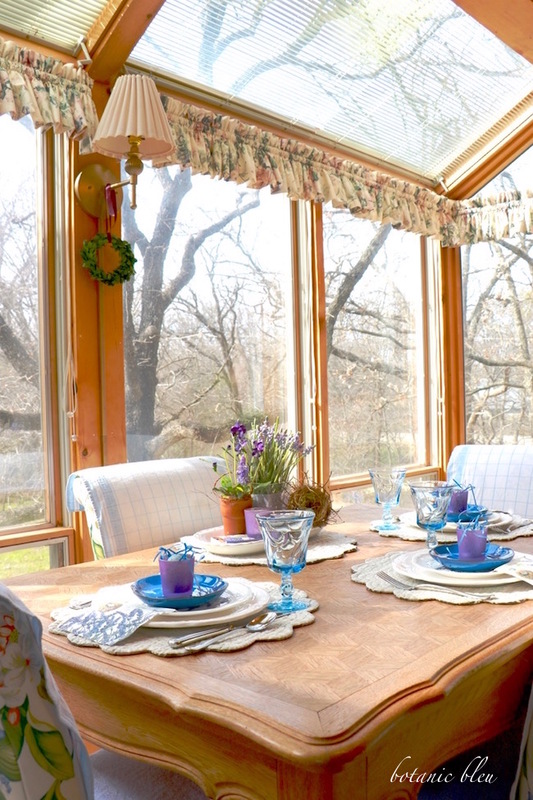 Your natural light is perfect by your kitchen table to photograph your tablescape. Blogging friendships are enjoyable bonding with others with common interests, learning from them and sharing experiences. A pretty table and such a nice colour combination. All I could think is PRETTY, PRETTY, PRETTY. Stopping by via Lynne's page. Judith, your table settings are gorgeous! I love the centerpiece and those dishes are just so beautiful. I especially love the blue glasses! Love and hugs!! I so enjoyed this post and want you to know how much you have both inspired me and educated me. Continually, I am amazed how generous bloggers are with their talents and knowledge, and how willingly they share. My life and décor has definitely been enriched.